Made from 1,200-denier nylon, these bags feature spiral wire that's attached to the exterior of the bag to help prevent it from collapsing. Feature webbing straps with quick-release buckles that can be used to adjust height of bag or collapse bag when not in use. A scissor snap offers easy attachment to belt. 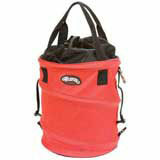 The convenient drawstring top closure provides quick and easy access.